We continue our series of video programmes featuring Southdown buses and coaches in 2015, the centenary year of this once great bus company. This time the independent transport videos cameras visited Worthing seafront on Sunday 5th July to record the events on a very special day. The occasion was the Southdown Reunion & Running Day. An event to bring together former members of staff including drivers, conductors, conductresses, inspectors, maintenance and office staff, in fact anyone that had worked with the company over the years. There were also a good number of bus enthusiasts and members of the public on hand to ensure that the celebrations went well! We begin the day on a rather damp Worthing seafront as the buses arrive to take up their duties. A timetable booklet was produced giving details of eight special services being operated on the day using former Southdown vehicles. Each route took the buses over roads they would have operated in the past. 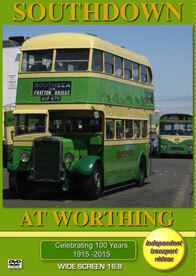 Worthing was the home of Southdown and the depot and offices are still in use by the current operator – Stagecoach. We have also included in this programme the current Stagecoach vehicles going about their duties giving an interesting comparison in how body styles have changed in the last 100 years, and how the contemporary livery of Stagecoach mixes with the traditional apple green and cream of Southdown. A good variety of former Southdown vehicles were on show and available for service. This included the Short bodied Dennis 30cwt from the Amberley Museum dating from 1927, together with their Tilling-Stevens, number 1205 (UF 6805) which were static displays. Vehicles in service included many Leyland's including a TD3, TD5, PD2, PS1 and of course PD3s. There was also a Daimler Fleetline and some Bristol VRTs. Also in service was Stagecoach South’s Scania N230 15586 (404 DCD) currently in the wartime livery of apple green and grey. Filming takes place along the seafront and outside the depot. We are privileged to gain access into the depot yard where a number of former Southdown vehicles were parked up on layover to capture them on film in surroundings that have changed little over the years. Three rides were taken and recorded for you to enjoy. All on route 31 to Aldworth Avenue, Goring. The first is on 516 (UUF 116J) a Bristol VRT/SL2/6G with an ECW H70F body. The second journey is on board 970 (AUF 670) a 1934 Leyland Titan TD3 with East Lancs H52R bodywork, dating from 1946, and our third ride is on 248 (GCD 48) a 1939 Leyland Titan TD5 with a Park Royal H54R body dating from 1950. Real gems, I am sure you will agree! This was a really excellent event. We would like to thank Chris Pearce and his helpers for making this a day to remember. We hope you enjoy our record of the day, a great memory if you were there, if you weren't – just see what you missed! Duration : 59 minutes (approx).